Part of my long run with the girls on Sunday was dedicated to Team Gab. Have you gone over to her blog to check it out? Giraffy is raising money for Pediatric Cancer Research in honor of her daughter who has been diagnosed with leukemia. 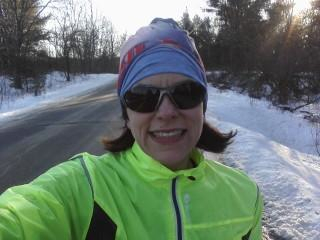 I signed up for a 10K, so here you go, 6.2 miles of my 10 mile run with the girls on Sunday is for you, Gab and Giraffy! Holy cow that look cold!! !